While we’re still collecting data for the public Bulc Club Statistics, we wanted to release a preliminary chart of 2015’s growth in traction for Member Ratings. Increase the spam score for these email addresses or domains. Any email from addresses or domains with a score higher than 50% will automatically be held in their console for thirty days. A member then has thirty days to decide if they would like the mail forwarded to them (by clicking “Allow Address” or “Allow Domain”) or the message is automatically deleted. Implicit blocks, or messages that remain in the queue for thirty days before being deleted, also contribute to member ratings. Over the last twelve months, we’ve been monitoring not only growth in membership (free and paid), but also the increased number of people that use Bulc Club Member Ratings to verify if senders are spamming them or not. While you need an account to rate these senders, the ratings themselves are public and accessible. The above chart shows the growth in traction for member ratings, by logging and reporting unique and repeat visitor information. 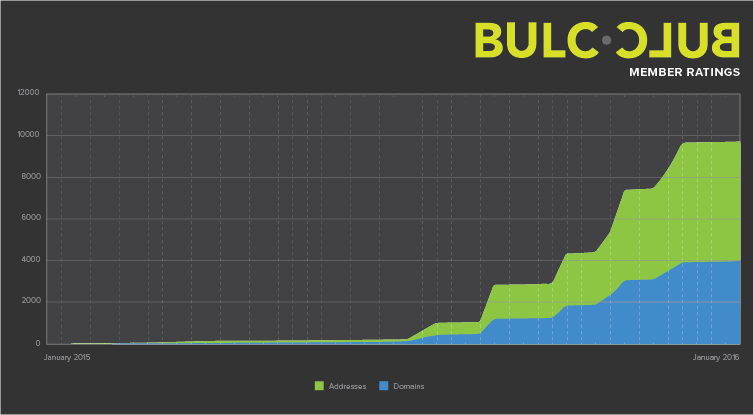 Whether they’re Bulc Club members or non-members who are simply interested in our data, their visits and actions reveal a lot about how Bulc Club is helping to not only determine the likelihood of spam, but deter and prevent its delivery. Not only is the increase in public interest in our ratings providing further data to help in our mission, but it’s validating that our service is truly helping people around the world. It’s our hope that by providing a public API for Bulc Club Member Ratings, email providers (e.g., Gmail, Yahoo), web hosts (e.g., LiquidWeb, MediaTemple) and control panels (e.g., cPanel, WHM) will use this data to help prevent spam and bulkmail on platforms other than Bulc Club. Theoretically, our member ratings could truly accomplish our mission: to rid the world of spam, everywhere, forever. If you’re interested in joining us in the fight against spam and bulkmail,you can do so by joining the club, sharing this article to your social networks (links below), and increasing awareness about our service by talking to friends and family about what we do. We’d love your help!